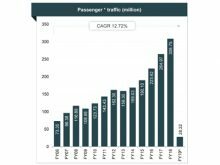 India’s passenger traffic grew at 16.52 per cent year on year to reach 308.75 million. According to a report by India Brand Equity Foundation (IBEF), it grew at a CAGR of 12.72 per cent during FY06-FY18. The report reveals that by 2036, India is estimated to have 480 million flyers, which will be more than that of Japan (just under 225 million) and Germany (just over 200 million) together. India has become the third largest domestic aviation market in the world and is expected to overtake the UK to become the third largest air passenger market by 2025.